Oh No! She's cheating I hear you cry, that's how she started the alphabet last year! That would be very true, it *is* how I started the challenge last year, and it's also how I started My Glass Beadmaking Journey, it was was born out of my Addiction to glass generally, but this is also about my Adventures with Glass too. There's something about buying glass beads, then blogging about glass beads that leads some people, like me, onto making their own glass beads, and that's simply how I started! Is it getting a bit hot in here? Action Shot!! A whole heap of stuff happened inbetween, but I hope to share some of this with you during the A to Z Blogging Challenge, along with some stories as we go along. I hope you'll come back and join me tomorrow for B? What Addictions have led you into having fun Adventures as a result? I like that it's led you onto travels, meeting people and enjoying those special moments in the research, that sounds like a good addiction to me! I was addicted to Farmville once, which led me to having lots of fun with complete strangers on Facebook! I've found that my bead addiction generally has also led to me making friends via facebook too! It's been lovely meeting up with some of them at bead events. My addiction to Highlander when it was on TV in the 90s led me to going to Paris with four others, some of whom became some of my best friends :) I also went to cons and met lots of long term friends that way too. Addictions like that are the best :). Your Paris trip sounds great! We went to Paris following a "band" and my husband had to go everywhere where Amelie was set/filmed. I actually met my husband at a gig for the band so I guess lots of my passions, have brought me many friends when I think about how I've met & know people. Got to agree taht addictions like that are the best! My addiction, if you could call it that, has always been books. I LOVE them and my adventure from that came my love of writing. I'm curious, do you have pictures of glass that you have created? Ah one of my other great loves, my grandma taught me to read before I started school and I've never stopped, one of the greatest gifts someone has given me! I do have pics, if you come back for B there will be some lovely ones tomorrow! I'm going to do a mix of stories, showing work, chatting about things that happen... I hope it's interesting but I'm just going to roll with it, still got a lot to write! Hi Mars. I've always enjoyed learning what drives someone's strong passion for something... and admire that you have done something with your 'addiction.' I've never really been addicted to anything, though there have been a few obsessions, mostly men. :) I'm not addicted to fitness yet but have developed a passion for it... and it's leading me to a lot of fun places. Happy to see you back doing the challenge. I love that you got a job in a gym as a way to get fit, I'm so looking forward to the rest of your A to Z! It's great to see the start of the Challenge again, I'm looking forward to reading all your writing! Hi Mars, I posted earlier but the internet ate it! Yay! Reading about your glass making journey is fab as one of my addictions is beads, I am also addicted to reading -:) So both loves are covered by your blog challenge, heaven! I think the internet is hungry tonight, a few of my posts on other blogs seem t have gone awol, I've also deleted several double posts from here! LOL, it was my addiction to beads that lead me to make my own silver beads! Although, I have always liked crafty things and being a maker so I guess I might have stumbled onto it at some point if I hadn't been addicted to beads. My SIL is amazingly creative (seriously talented!) and we had a good discussion about metal clay at Christmas time. She has dabbled a bit as well. I am *so* excited for your A to Z theme this year! Ditto for your theme! I saw a silver clay class 2 years ago, but the cost was quite expensive, but I was super curious about it! I guess I've often dabbled - but apart from glass beads, the other major making I got into was candles, I still have most of my kit from then... and I mostly stopped because it was in the days before the internet and my local wax pellet supplier stopped stocking wax in any kind of bulk and the "try it once kit" wax was too expensive. How cool that you make your own beads! Looking forward to learning more about that. I'm addicted to exploring new places and have been on many adventures because of it. Cheers! Should be an interesting month. Good start! I love your A to Z topic, looking forward to the rest of it! 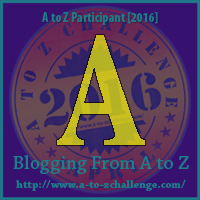 An excellent theme for your A to Z and I look forward to finding out much more! I think addiction to books is such a valuable addiction, as I said to someone earlier on in the comments, being taught to read well before school was the best thing that I've been taught, I love love love to read, there's always an adventure waiting if you can read. Although it has come in handy at work when I've needed to find an email from 2 years ago! I love road trips, I once spent a week travelling around Europe in a van with a band - great experiences! Love is a good one, is it unusual for partners to travel with drivers? I've never come across this before but it certainly sounds fun! I am just addicted to books and coffee....and life. :) I can't wait to read about your glass bead making! This post is such a teaser! Those and 3 very good things to be addicted to, and you're right, it's a teaser post that ties in with the start of last year's challenge too! I'm normally known for writing about other people's beads so it's strange for me in some ways to be talking about my own, but I promised I would stop being so shy and start writing about my own work a bit more - so the challenge seemed like a good way to kickstart this. A great theme for the challenge. We have some many addictions, aren't we all?! Yep we do, I think for the people commenting who take part in the challenge we are usually driven to be passionate about something, we blog after all and as we all know that's not an easy thing to do, and keep doing. It's part of the reason I love the challenge, is to connect with other bloggers for the month and discover a whole host of things I didn't know about, I usually pick up at least 3 new books because of the challenge by stumbling across new writers. I'm addicted to poetry writing and it's helped me overcome many damaging addictions. It's literally a life saver. Love your theme on MS Calling, looks like a lot of work but a *great* way to raise awareness! Overcoming damaging addictions is certainly a huge achievement, hats off to you!